I’m still working my way through that large bag of sweet potatoes from the CSA. The other day I decided to roast them in the oven with other root vegetables. 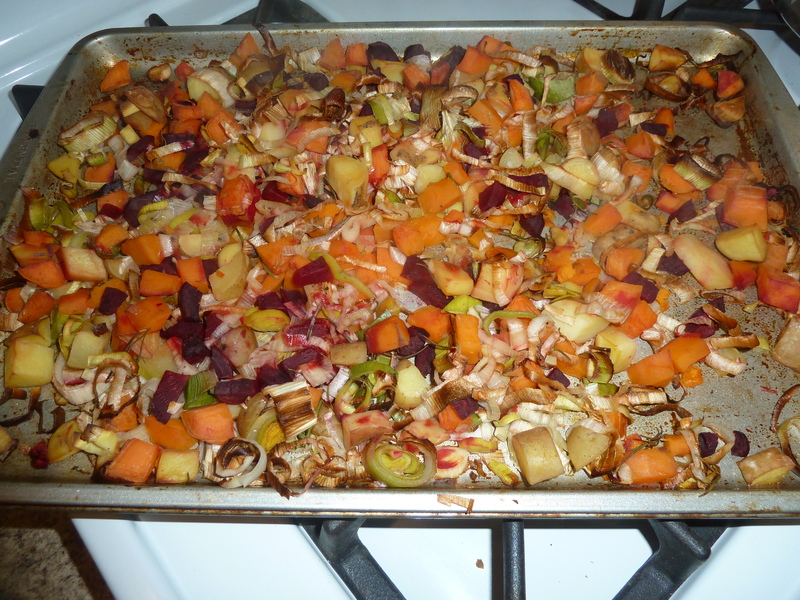 When you roast root vegetables, you can greatly reduce the cooking time by steaming them first for about 5 minutes. Once you have the vegetables in the steamer, you could, of course, just go ahead and steam them till they’re done and skip the whole roasting in the oven part. Laziness often leads me to do this. But the roasting part is worth doing because the vegetables come out tastier that way, and you can cook them with other vegetables you might not want to steam, such as garlic and onions. To make roasted roots, preheat the oven to 375 and grease a baking pan or cookie sheet. Peel and dice the vegetables. I used sweet potatoes, white potatoes, and beets in my recent batch. Carrots and turnips would also work well. Steam the vegetables for 5 minutes. Meanwhile, chop some garlic cloves and one or two onions or a leek. Combine all the vegetables on the baking sheet and sprinkle with a couple of tablespoons of olive oil, chopped fresh or dried rosemary, and salt to taste. Roast in the oven for about 30 minutes, until vegetables are tender. Stir once halfway through the cooking time. 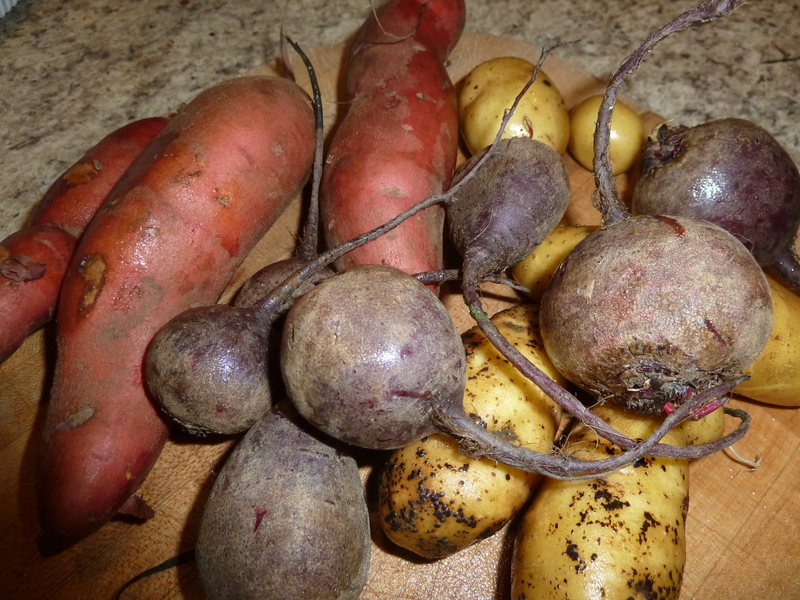 Local: sweet potatoes, white potatoes, beets, leek, rosemary, garlic – all from the CSA. This entry was posted in food from the garden and tagged potatoes, recipes, sweet potatoes. Bookmark the permalink.